With the cost of moving being so high, home improvement is regularly an option chosen by homeowners. Often with extensions, the new elements of roof are required to run in line with existing sections of roof or avoid ridgelines etc. 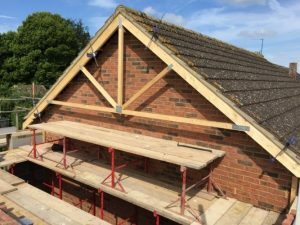 In these instances, there is no alternative to getting the tape measure out and completing a survey on the existing roof. Robinson Manufacturing can supply a Match With Existing form (see below) for you to complete when looking at completing site measure for existing roofs. 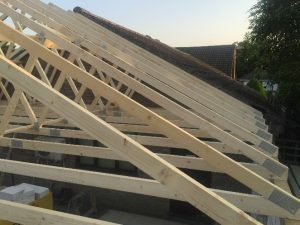 It has all necessary areas of the roof marked that need to be measured. The bottom left of the form should be completed if the existing roof is trussed rafters and the bottom right if it’s a hand cut roof. The top section, detailing the whole section of the roof should always be completed. A ‘Match With Existing’ form. 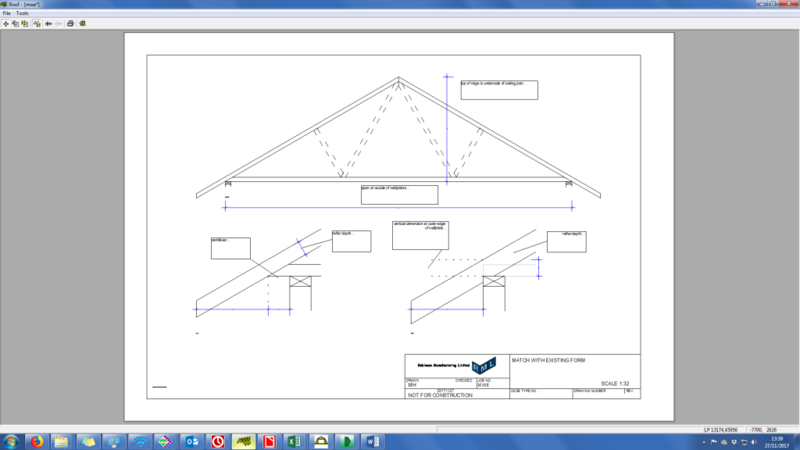 It’s fairly obvious to state that most of the roof trusses we make are triangular, therefore calculating the existing pitch of the roof involves should only require two measurements; Overall height and span. Trigonometry could then be used to determine the pitch. The issue with this is that it doesn’t take into account the depth of the rafters and would give an answer that would mean that the new trusses would be too steep. With the deduction of the dimension marked in red from the overall height of the truss, the true pitch of the rafters can be calculated. As well as the dimensions of the existing roof, it is important that we know how the old wall and the new wall line through. 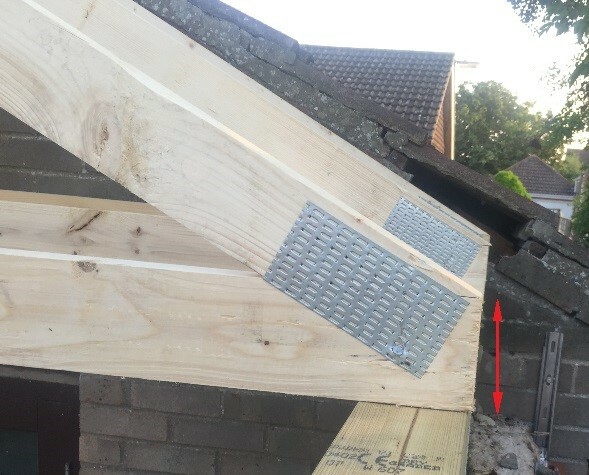 With regulations now requiring minimum cavity widths, new walls are often thicker than older construction therefore wallplates will be out of line and possibly not at the same level. Armed with all of this information, a perfect fit is guaranteed! This entry was posted in Product Features by Robinson Manufacturing, Self Build. Bookmark the permalink.